Currently I'm creating a QTreeView where the 3rd column delegate is set to a ComboBox for editing. However I would like to give users the ability to toggle different views with the given data as seen in the images below. How would you recommend I handle the ComboBox being assigned to the correct row/colum for the specified cells as show in the images below? 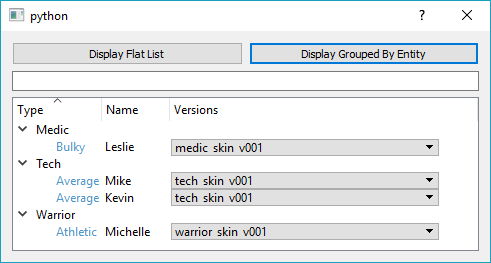 The Flat List version works great, I'm not sure how to handle the other display option. Is there a way to set the delegate that provides a QComboBox, as an editor, per row/column? Browse other questions tagged python pyside qtreeview or ask your own question. Which node from TreeView is selected (PySide)?